1767-1842. He was born in Durham, an elder son of Edward Butterfield and of his wife, Elizabeth Harrison. He was a relative on his mother’s side of the M.P. for Bodmin, William Masterman, who was a supporter of the government during the American Revolutionary War. Butterfield joined the Navy in February 1781 under the patronage of William Masterman aboard the Buffalo 60, Captain William Truscott, in which ship he fought at the Battle of the Doggersbank on 5 August. Transferring with that officer to the Nonsuch 64, he fought at the Battle of the Saintes on 12 April 1782, and after returning from the West Indies his ship was paid off at Chatham in August 1783. During the peace he served on the coast of Africa from 1783-6 aboard the Grampus 50, Commodore Edward Thompson, on the Newfoundland station with the Winchelsea 32, Captain Edward Pellew, and aboard the Plymouth guardship Culloden 74, Captain Sir Thomas Rich. Having passed for lieutenant in 1788 but not been commissioned, Butterfield was a midshipman from the early summer of 1790 in home waters aboard the Melampus 36, Captain Charles Morice Pole, but he left the Navy after suffering constant bullying from Lieutenant Richard Hancorn which resulted in he and four other young officers abusing the tyrant in a tavern in June and being hauled before the Winchester Assizes a year later. At the commencement of the French Revolutionary War in 1793 Butterfield was pressed back into the navy from an American merchant ship, the Anna, and having been drafted to the Majestic 74, Captain Charles Cotton, he was soon given a berth in the midshipman’s mess by this officer. Commissioned lieutenant on 11 April 1794, he was aboard the Majestic at the Battle of the Glorious first of June, following which this vessel went out to the Leeward Islands in October flying the flag of Vice-Admiral Benjamin Caldwell and commanded by Captain George Blagden Westcott. Here Butterfield was allowed to transfer into the Andromache 32, Captain Thomas Jones, in order to return home, although whilst sailing for Halifax the frigate was dismasted in a hurricane. Eventually Butterfield returned to England aboard the Oiseau 36, Captain Robert Murray, and he rejoined Captain Cotton who had been appointed to the newly commissioned Mars 74 at the end of November 1794. Remaining with that vessel, he was her first lieutenant in the action with the Hercule 74 on 21 April 1798, and he assumed command when Captain Alexander Hood was killed. Following the successful engagement he brought the captured Hercule into port, and as well as being much lauded in the press he was promoted commander with seniority from 26 April and also received a fifty guinea sword from the Mars’ crew. 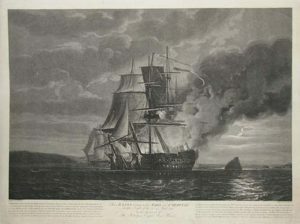 In July 1798 he commissioned the Hazard 18 for service on the Irish station, and on 12 August he captured the French armed ship Neptune 10, carrying two hundred and seventy soldiers from the Ile de France to Bordeaux, in an action lasting almost two hours in the northern Atlantic, the enemy losing twenty men killed and wounded. On several occasions the French soldiers tried to board the Hazard, and they might have proved successful had a French privateer that was in sight to leeward endeavoured to join the fray. Butterfield briefly commanded the Foudroyant 80 for twelve days following the death of Captain Sir Thomas Byard on 31 October, bringing her from Lough Swilly to Plymouth, and upon returning to the Hazard he remained on the Irish station until coming into Portsmouth at the end of September 1799. He later took a convoy out to Newfoundland at the end of October 1800 before spending further time on the Irish station. In March 1801 he was accorded much praise for rescuing the Indiaman Triton on the coast of Ireland after her predominately Lascar crew had been unable to cope with the severe weather. A material award followed later when he was gifted plate to the value of one hundred and fifty guineas by the Triton’s grateful owners. The Hazard returned to Portsmouth after a cruise in May 1801 before taking a convoy to Cork in the following month and heading for the Downs with another, with Butterfield earning further acclaim for not losing a single vessel during these voyages. A refit at Portsmouth followed, and then leaving the harbour in September she headed north to Scotland to take aboard state prisoners for transportation to Dublin. In April 1802 the Hazard returned from Cork to Plymouth, and with Butterfield being posted captain on 29 April he left the sloop after four years service. For the next four years Butterfield remained unemployed, during which time he re-married and began a family in Chelsea. Returning to duty, he earned the praise of Commodore Sir Home Riggs Popham when acting as the agent of transports at the capture of the Cape of Good Hope in January 1806. 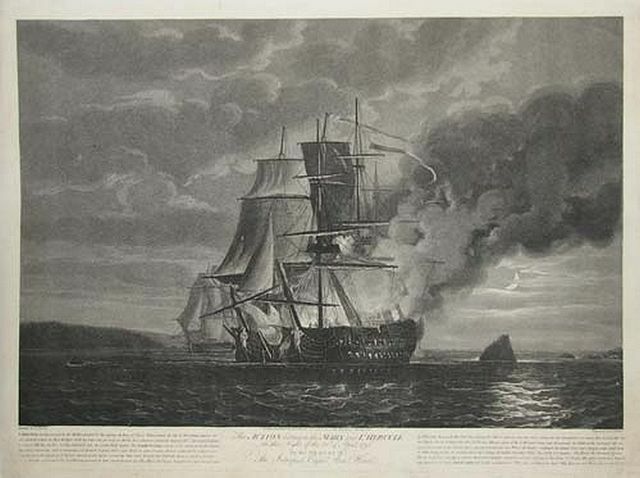 Further service followed with the Tralee Sea Fencibles in Ireland, and he commanded the Courageux 74 in an acting capacity in the Channel during the late summer of 1810. In October 1810 he commissioned the new eighteen-pounder Malacca 36, sailing for the Cape in the following January and from thence to the East Indies. In August 1812 he was brought to a court-martial at Madras for having despatched the Minden 74, Captain Edward Wallis Hoare, in convoy to Europe at the request of the merchants, but without having the sufficient authority to do so. These circumstances had been brought about by the death on 6 March of the commander-in-chief, Vice-Admiral William O’Brien Drury, and the absence from the station of the prickly Commodore William Broughton, who was at Java, leaving Butterfield as the senior officer. Once he was apprised of the Minden’s departure Broughton requested the new commander-in-chief, Vice-Admiral Sir Samuel Hood, to convene the court-martial that found Butterfield guilty and ordered his removal from the Malacca. He returned to England as a passenger aboard the Modeste 36, Captain James Coutts Crawford. His final command was the Stirling Castle 74, which he had from June 1814 in succession to the elevated Rear-Admiral Home Riggs Popham, although with peace having broken out his sole task was to bring troops home from Bordeaux prior to paying this vessel off in November. Butterfield was promoted rear-admiral on 17 August 1840, and he died at Portsea, where he had long resided, on 3 October 1842. He was buried in the graveyard of the Garrison Church, Southsea. He married firstly Eliza White on 16 April 1799, by whom he had a son, and secondly on 30 October 1804 at Bersted near Havant, Elizabeth Harris, the daughter of the deputy-auditor of the Impress at Chelsea Hospital. His second marriage yielded a daughter and six sons, one of whom, Edward Harris Butterfield, gained the rank of captain in the Navy.